The Cavatelli with Tomato and Basil Pasta Kit is an artisanal pasta kit that makes it really easy to create this simple, traditional dish at home. A lovely present for every aspiring cook! 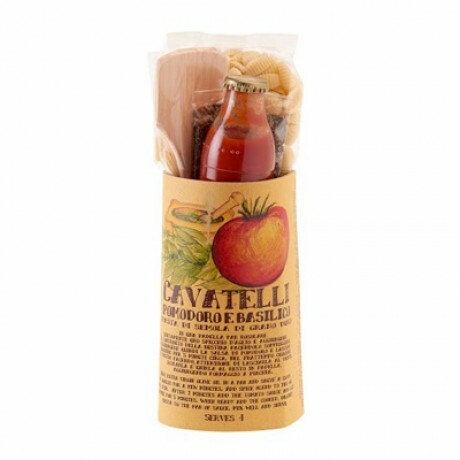 The kit contains Cavatelli pasta, a bottle of tomato passata, a packet of dried basil and a handy wooden spoon. An easy recipe is also included - just add a clove of garlic and some extra virgin olive oil to make a delicious sauce. Pasta: Durum wheat semolina, water. Tomato sauce: Tomatoes, salt. Dried basil: Basil, salt.